This long-awaited new edition of an established best-selling title brings the story of lighthouses in Scotland up to date now that the task of automation is finished. With many additional photographs, map and a concluding section, this book remains a must for anyone with an interest in lighthouses. 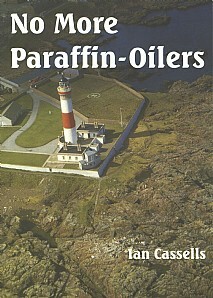 In the book Ian Cassells, a former lightkeeper, provides a light-hearted and true account of life in the Lighthouse Service where 'Paraffin-Oiler' was the nickname for a Scottish lightkeeper. He provides fascinating detail about the lighthouses themselves, their construction and the development of the Service. Though personal reminiscences and tales from colleagues he builds up a vivid account of the day-to-day life and the characters who were involved in this peculiarly solitary occupation. The book is not without humour and mystery and the author deals with the infamous Flannan Islands mystery logically and with the insight perhaps only an ex-keeper could possess. This highly readable and acclaimed book is enhanced by the inclusion of numerous photographs, many of them new to this edition, which highlight the stunning locations of many lighthouses. In addition, they enable the reader to appreciate the remarkable achievement of those responsible for building the lights and manning them, until so recently.